A few days after I asked my bridesmaids to be in my wedding party, my bridesmaid Allison sent me a message. "Thank you for asking me to be a bridesmaid," she said. "I was shocked and it means so much to me. I don't know how to be one but if I'm supposed to be doing anything tell me." It was such a cute reaction ... and honest too. If you've never been a bridesmaid before, you just don't know what to do. It's more than just buying a dress and standing next to the bride on her big day. But what exactly do you need to do to be the perfect bridesmaid? I have a list for you put together with the help of my wedding twin Kristiana (that's her and her bridesmaids in the photo below). 1. Be available and involved. I'm not saying sleep with your phone under your pillow so the bride can call you at 3am crying over envelope sizes. But if she calls you, call her back. Maybe it won't be for a few hours (yes, bridesmaids have their own lives), but don't ignore her and not call her for days. You are one of the most important people in her life and she needs you right now. Even if you don't really care about wedding welcome bags, just listen to her when she calls you to talk about them. Being there for her is so important. And if her engagement is long, yes, it's a long time for you to be there for her. But try to stay involved. As Kristiana suggests, "Send her count down texts, post wedding things on her wall, talk wedding, show that you care and that you're excited for her to marry the love of her life! Having uninterested bridesmaids is a terrible feeling for the bride." 2. Be friendly with the other bridesmaids. Facebook makes it so easy to keep in touch with people. Maybe you don't know the bride's other 'maids, but it's not that hard to reach out via Facebook and submit a friend request. Send one to the bride's mom too. Maybe you'll make a new friend out of it. And maybe you won't, but at the very least, you'll be able to send a group message to all the bridesmaids when you're wondering if you're going to do a group gift for the shower or not. If you want to delete these people after the wedding is over, that's fine. If you don't like the other bridesmaids and never want to see them again, that's fine too. But during the wedding planning time, you will have to see and interact with these women. For the sake of the bride, just act friendly and keep any personal vendettas until after the bride has been happily married for 48 hours. 3. Start saving. Like right now. When you say yes to being someone's bridesmaid, you have to remember that it's pretty expensive. At the bare minimum, you'll have to pay for your dress and shoes. The bride is already paying thousands of dollars for the rest of the wedding, you can't expect that she is going to pay for your dress too. There are also other wedding-related activities that cost money (bridal shower, bachelorette party, etc.). As a bridesmaid, you're pretty obligated to show up to the shower, although the bachelorette is a little more volunteer. These things cost money. So does getting your hair/nails/makeup done for the wedding. If something happens (you lose your job, Sally Mae comes knocking on your door looking for your student loan payments, etc.) and you can't afford something, tell the bride. She is one of your best friends and will understand if you don't have the money to stay overnight in a hotel room after the wedding. She will do her best to work with you. Maybe she'll find a family member who has a couch that you can crash on that night; maybe she'll let you sleep in her apartment that evening. Whatever it is, she will work with you as long as you are honest with her. 4. Support all the bride's decisions, no matter what you really think. It's not your wedding day. You are not the star of the show; you are the supporting cast. Don't like the five-inch heels the bride picked? Sorry honey, but you just better practice walking in them. You can hate them all you like, but don't tell the bride you hate them. Smile, pay for your heels, and then donate them to Goodwill the morning after the wedding. Whatever you do, do not complain to the bride about them. She has too many other things on her mind to worry about the height of heels that you feel most comfortable in. When it's your day, pick two-inch heels. Or sleeveless bridesmaid dresses. Or pink carnation bouquets. Or whatever choices you like best. But when you are the bridesmaid, you should really just support any decision the bride has made. She has spent months agonizing over things like centerpieces. When she finally decides on one, just tell her she made a great choice and ask if she needs any help assembling it. Don't tell her that a pair of starfish in the center of the table is dumb. Just make a mental note to not have them at your wedding if you hate them that much. Kristiana says this a little simpler than me: "Don't complain. About anything. Not needed. Not necessary. Not appropriate. Don't like the beer and wine selection? Drink water. Hate the food? Too bad. Cake too sweet? Doesn't matter. Do NOT complain." 5. No means no. And yes means yes. There's no gray area. If you ask the bride if she needs you to carry her bag and she says no, she's got it, do not try and grab the bag from her. If she wants you to carry her bag, she will ask you. And if she does, you carry that bag like it is the most important task ever to happen. And keep that in mind during planning also. If you ask if she needs help with anything and she says no, then no means no. Don't rattle off a list of things you can help with because, at that time, the bride may not be worried about those tasks. And don't take it to mean the bride doesn't need or want your help. She does. But at that point, she just might not need anything. Maybe she's studying for a test and isn't even planning the wedding that week. Don't worry. Next week, just send a text asking if there's anything you can do. That little text will mean the world. At my rehearsal dinner, I couldn't eat. I just didn't have time. I made a plate of food at one point, but with 100 people to say hello to and entertain, plus a caterer to juggle, it was impossible. At the end of the night, my bridesmaid Gionna came up to me to see if I needed anything. "Yes," I said. "Can you make me a plate of food with some pulled pork, two rolls, and two pieces of corn." She didn't ask if I also wanted salad or butter or ribs or chicken. She just said no problem and returned with exactly what I wanted. It was absolutely perfect. Be that perfect bridesmaid. 1. Don't make this about you. When you get married, the spotlight will be on you. But as a bridesmaid, you are not the center of attention. You are someone who may get blurred out in some of the photos. That's just the reality of it. Embrace your sideline roll. Enjoy it. Don't, for any reason, try to put yourself front and center. Don't sulk in the corner so people come your way. Don't decide you're going to grab the mic and sing a solo without the bride knowing. If it is really important to you to sing a song at the wedding, ask the bride. Don't just all of a sudden run to center stage to belt out Etta James' At Last. There is no reason all eyes should be on you, except when you're walking down the aisle before the bride gets there. Other than that, one of your main tasks is to blend in, not stand out. The groom, that's different. If he gets drunk and wants to sing a song for the bride, that's something they'll laugh about six months or six years from now. The drunk bridesmaid? No. 2. Dance. Mingle. Have fun. I remember being on the dance floor at our wedding and Allison was dancing. We were at a mutual friend's wedding about nine months before and Allison refused to dance with me. But here she was, at my wedding, dancing. I was so excited that I had to say something. "You told me at Jessica's wedding that I had to dance at your wedding," she said. Accidental threat? Oops. But it does come with the territory. When you're a bridesmaid, you have to help get the party started. If there's a conga line, you need to be on it. If you're single and the bride is going to throw the bouquet, you have to try and catch it. Just be involved and have a good time at the party. If you see someone sitting alone, grab them and bring them to the dance floor. Dance with the ring bearer. Cha cha with the groom's grandpa. Whatever it takes to be involved and help the guests have a good time, do that. 3. Ask the bride if she needs anything. Every once in a while, check on the bride. Find her and ask her how she's doing and if she needs anything. If she asks you to grab her a glass of water from the bar because it's impossible for her to get there without getting stopped by thirty people, then you walk to the bar and get her a glass of water. Don't stop to talk to anyone. Don't get distracted. Just get her a glass of water and come back to her with it. And if she asks you for an aspirin because her feet are killing her, you ask every guest until you find a pair of aspirin for the bride. Bring them to her with a glass of water. From Kristiana: "Make sure the bride drinks water. Make sure her dress straps are straight in case they start to fall. Fix a curl that's caught in the veil. Make sure that any to-go food prepared by the caterer is not stolen by a wedding guest. Being a bridesmaid doesn't stop after the ceremony." Your friend is getting married. This is one of the happiest days of her life. And you should be happy for her. As Kristiana put it: "Your friend is getting married!" It's true. One of your best friends is getting married. You absolutely should be happy for her. So look happy. There's nothing that ruins photos like non-smiling faces. Trust me. I can tell you that from experience. I was looking at my photos where my face is resting and those pictures just aren't as nice as the ones where I'm smiling the whole time. And it was my wedding. I was happy. But no one reminded me to smile. So we are reminding you. Smile. Smile smile smile. 5. Stay to clean up. At the end of the night, the guests tend to just vanish, leaving the bride and groom all alone to help break down centerpieces, collect leftover favors, and pack them somewhere. Yes, the venue usually has someone to do this, but the bride and groom need to be there to carry things away. Don't linger and don't ask the bride if she wants help (she will say no). Just. Help. Stay around and find out who is in charge of breakdown. Ask them where you can pitch in and do it. The bride will forever be grateful that you were around to help her until the very last moment. 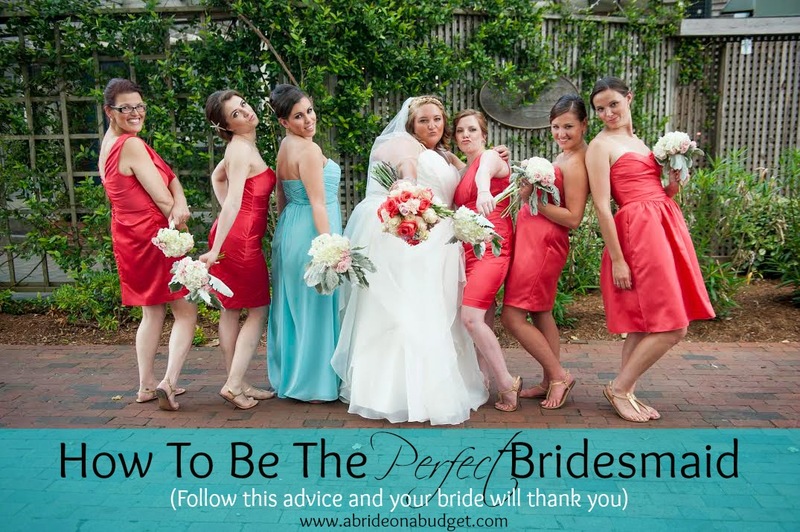 BRIDAL BABBLE: What other tips would you add to help someone be the perfect bridesmaid? I love this as a great resource for a Bride to Be, along with her Bridal Party! I think the main tip that stands out the most is being supportive in everything.